Timeless melodies and a unique lyrical mythology create the foundation of each spectacular Seahorse song. In an age defined by packed cables full of zinging 1\'s and 0\'s, it’s no wonder the music soundscape is awash in compressed MP3 files, digital singles, and MySpace audio streams. It’s a ‘trade your guitar lessons for Garage Band’ kind of world, and fewer and fewer artists seem able to traverse the technological void to truly move the listener. Less and less, we hear about the true album “experience,” those formative moments where you remember the exact moment you “heard” the record that changed the colors in your world. And how many of those moments come from the self-recorded release? 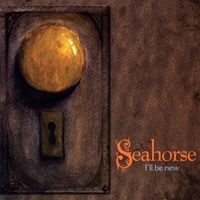 Seahorse’s first album I’ll Be New flies in the face of this binary disconnect, shunning the confines of home recorded staleness, entering a world brimming with mythology, bittersweetness, and inward focus. The collection of nine songs, compiled into a truly cohesive vision, feels like an old friend; one who urges growth, spouting the ideas of change. Each song is anchored by warm, melodic vocals, harnessed to an acoustic guitar, impasto piano riffs, and studio tinkering. Songs like “Phony” and “Just Beyond the Hill” are heavy on the latter, spilling over into the worlds of electronic fuzz and tin can drum-kits. But even then, a voice shines, sparring with the listener in struggles of ideology and the heart. Seahorse’s lyrics are packed with possibilities, thick in references to love, iconic creatures, and even “Galileo walking on the Galilee,” Pictures painted in stanzas like, “I buckled my knees, counted to three/And thought of you and me/I sharpened my claws on a hunch I could feel/that heaven’s hidden here,” never sounded so sweet. Between the softly spoken admissions of “Show & Tell” to “All Over Again,” there are just over thirty minutes of transcendence, suitable for any attention span. And yet, these sounds resonate far beyond the hiss of the last chord to a place full of mystery--questions with answers for the listener to find, answers with questions unknown. Perhaps this is where the connection lies, where the cold transitions of a hard-drive are overcome. In the end, these will be the songs inside falling leaves, seen through a lighted stained glass, and in quiet moments before sleep.